Asthma is characterised by inflammation and respiratory symptoms. Current asthma treatment is based on severity of asthma symptoms only. Exhaled nitric oxide fraction (FeNO) is not recommended by the Global Initiative for Asthma guidelines. The aim was to compare the usefulness of a FeNO guided versus symptom-based treatment in achieving improved asthma control assessed by airway hyperresponsiveness (AHR). 80 asthmatic patients were included in a double-blinded, parallel, randomised controlled trial with follow-up visits after 8, 24 and 36 weeks. Treatment was tailored using either a FeNO or Asthma Control Questionnaire (ACQ) based algorithm. Inclusion criteria were asthma symptoms and a provocative dose causing a 15% fall in forced expiratory volume in 1 s <635 mg mannitol. At each visit AHR, FeNO, ACQ and blood tests were performed. No differences between the two groups were found at inclusion. 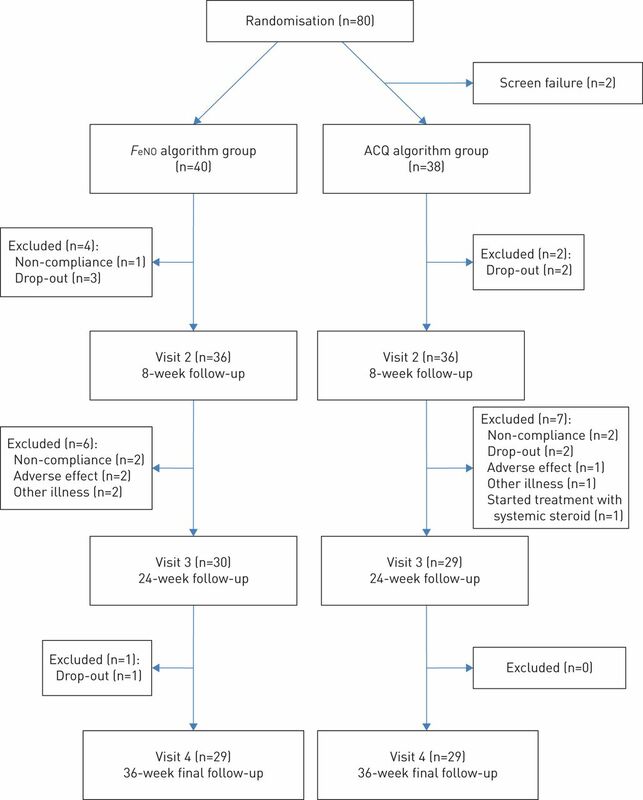 AHR from 8 to 24 weeks was improved in the FeNO group compared to the ACQ group (response dose ratio (RDR) geometric mean (95% CI): 0.02 (0.01–0.04) versus 0.05 (0.03–0.07), respectively, p=0.015). AHR to mannitol at 36 weeks showed no differences between the two groups (mean difference RDR (95% CI): −0.02 (−0.05–0.02), p=0.3). Total doses of inhaled steroid and number of exacerbations were similar (p>0.05). When using FeNO as a treatment management tool, lowering of airway responsiveness occurred earlier than using ACQ. However, airway responsiveness and asthma control after 9 months were similar. Asthma is a heterogeneous disease, usually characterised by chronic airway inflammation and reversible airflow limitation. Current asthma treatment guidelines are based on the Global Initiative for Asthma (GINA) recommendations, which suggest a stepwise approach in asthma treatment. Most steps involve treatment with inhaled corticosteroids (ICS). Long-acting β2-agonists (LABA) are suggested at increasing severity. In severe asthma, add-on treatment includes long-acting muscarinic antagonist and biological agents. Add-on treatment with biological agents is based on inflammatory phenotyping, whereas GINA guidelines are based on asthma symptoms only and do not take levels of airway inflammation into account . Recent research aims to determine the clinical use of asthma biomarkers in a manner of personalised therapy, which will need a shift in asthma treatment from a symptom-based to a precision medicine approach. Different asthma phenotypes have been described based on clinical characteristics and general inflammatory mechanisms. The most well-established cellular mechanism is eosinophilic (T-helper 2 (Th2) high) airway inflammation in asthma . This Th2 airway inflammation is characterised by elevated levels of cytokines such as interleukin (IL)-4, IL-5, IL-13, immunoglobulin (Ig)E, and high blood or sputum eosinophilia . Asthmatic patients with eosinophilic airway inflammation are more ICS sensitive and have a good and rapid response to this treatment [3–5]. An association between sputum eosinophils and exhaled nitric oxide fraction (FeNO) has been reported [6–8]. Measurement of sputum eosinophils is comprehensive, expensive and not easy to perform in daily clinic, whereas level of airway inflammation measured by FeNO  is standardised, easy to perform and with an immediate result, and hence very useable in the daily clinic. The clinical use of this measurement is still a conflicting subject. It is established that FeNO can be used as a diagnostic tool , but the use of FeNO as a guide for monitoring airway inflammation remains a subject of research. Previous studies of the use of FeNO-based treatment algorithms are conflicting [10, 11]. However, as elevated levels of FeNO are correlated to airway hyperresponsiveness (AHR) towards mannitol in both selected and unselected groups of patients [12, 13]. It is suggested that asthmatic patients with high FeNO, sputum eosinophilia or AHR towards mannitol are more responsive to steroid treatment. We tested the hypothesis that a FeNO-based treatment algorithm would improve asthma control significantly, indicated by decreased levels of AHR, compared to a symptom-based treatment algorithm. 80 asthmatic adult patients (aged ≥18 years) were included in a double-blinded, parallel, randomised controlled trial (RCT) of FeNO guided anti-asthma therapy versus symptom guided asthma management over study period of 9 months at the Respiratory Research Unit at Bispebjerg Hospital (Copenhagen, Denmark). Inclusion took place from September 2012 to June 2015 and included patients were recruited either from a private asthma clinic outside the hospital or from the hospital-based outpatient clinic. Patients with a doctor's diagnosis of asthma, including AHR (i.e. a provocative dose causing a 15% fall in forced expiratory volume in 1 s (PD15) <635 mg) to mannitol and asthma symptoms were included (figure 1). Participants could not have other pulmonary diseases and female participants should be using contraception and not be pregnant. After enrolment, participants were randomly assigned, using a computer-generated block randomisation with a block size of 10, to one of two treatment arms: 1) management based on the level of FeNO (tables 1 and 2); or 2) management based on the level of symptoms indicated by the Asthma Control Questionnaire (ACQ) (table 3), using the algorithm suggested by Powell et al. . In this study, a physician who was blinded to the treatment arms was responsible for the randomisation schedule, as well as the up and down titration of medication for each participant according to the algorithm and had no access to the participants at any visit or to the patient records. The physician sent a text message with the relevant medication adjustment to the research assistant, after which the research assistant informed the relevant participant by text message or email. The study was a “real life” study, thus a time deviation between visits was anticipated. This deviation was sought to be no more than ±14 days. All participants provided informed consent. All case report forms were evaluated by an independent good clinical practice unit and the study was approved by the local ethical committee (H-1-2012-106), Clinicaltrials.gov (NCT01978678) and EudraCT (2013-004905-15). Flow chart of the trial profile. Patients with a positive mannitol test were included. FeNO: exhaled nitric oxide fraction; ACQ: Asthma Control Questionnaire. The day of enrolment (V1) was less than 1 week from when the patient completed a positive mannitol test and the participants were randomised and demographic data was recorded. All other tests, except mannitol provocation, were conducted and included measurement of FeNO, lung function tests, skin prick test, sputum and blood tests as well as pregnancy tests for the female participants. Furthermore, all participants fulfilled a series of written questionnaires including the ACQ, the mini Asthma Quality of Life Questionnaire (AQLQ) and the mini Rhinoconjuctivitis Quality of Life Questionnaire. The follow-up visits took place 8 (V2), 24 (V3) and 36 (V4) weeks after V1. In case of unscheduled visits due to exacerbations, the following visits were postponed by 2 weeks from last day of intake of the exacerbation treatment. At each follow-up visit FeNO, forced expiratory volume in 1 s (FEV1), ACQ, mannitol test, and sputum and blood tests were performed in all participants. Sample size calculation was conducted using a power at 80%, a significance level of 0.05 and a cut-off value of AHR of PD15 >635 mg mannitol for loss of AHR of 80% in the FeNO group versus 50% in the ACQ group. This resulted in 39 participants in each group. Participants were started on different dosages of ICS, depending on their current treatment at randomisation. Steroid-naïve participants were initially treated with budesonide turbohaler (200 µg twice per day) and short-acting β2-agonist (terbutalin 0.5 mg as needed) from V1 to the following visit at V2, after which regulation was established based on the algorithm. Similarly, all participants already being treated with ICS at randomisation were continued on their current dosage for 8 weeks, after which they were regulated due to the algorithm. Thus, the treatment algorithms were introduced at V2. The initial dosage of ICS determined which treatment step each participant was regulated from at V2. Only participants already being treated with LABA prior to inclusion were continued on this treatment. In both treatment algorithms, the current dosage of ICS and β2-agonist determined which treatment step each patient was on at every visit. The regulation in treatment (decrease, increase or no change) was determined from this step (tables 1–3). Participants randomised to this treatment algorithm were regulated in two sequences. First, their visit specific FeNO value determined the regulation of ICS, and secondly their visit specific ACQ score determined the regulation of LABA. If a participant had a FeNO concentration <29 ppb as well as an ACQ score >1.5, 4.5 µg formoterol was added (tables 1 and 2). The ICS steps and LABA steps were independent from each other. For patients taking LABA in the FeNO group, ICS was never reduced to zero, but remained at 100 µg twice daily. Participants randomised to this algorithm were only regulated based on their visit specific ACQ. The algorithm did not contain regulations based on the participants visit specific FeNO value. After a doubling of ICS, if a participant had a further increase in ACQ 4.5 µg formoterol was added (table 3). Lung function was measured using EasyOne (ndd Medical Technologies, Inc., Andover, MA, USA) according to European Respiratory Society (ERS) recommendations . FeNO was measured using a nitric oxide analyser (NIOX VERO; Circassia Pharmaceuticals plc, Oxford, UK) during one full expiration according to American Thoracic Society/ERS recommendations . Two measurements were performed at every visit, and the mean was used for analysis. Baseline FEV1 was used to calculate the percentage decline of FEV1 [17, 18]. The method of the mannitol provocation test has been described previously . The test is supplied in kit form (Pharmaxis Ltd., French Forests, NSW, Australia). Response dose ratio (RDR) was calculated from the formula: FEV1 % decline/last dose of mannitol. Sputum induction followed the ERS guidelines by using incremental concentrations of NaCl solutions (3%, 4% and 5%) Processing, including sputum and differential cell count, was performed according to study by Pavord et al. . The level of systemic inflammation was assessed using high-sensitivity C-reactive protein as a biomarker. Furthermore, the measurement of specific systemic inflammation was determined by the level of interleukin (IL)-6 and IL-8 which was measured using the ELISA technique (FLUOstar Omega, BMG Labtech, Offenburg, Germany). Participants could be seen by the investigator in the outpatient clinic on a day-to-day basis in order to assess symptoms and severity in case of an exacerbation, which was defined as: 1) moderate exacerbation with increase of ACQ >1.5 and was treated with doubling the ICS dosage over 14 days; and 2) severe exacerbation with ACQ >2.0 and night-time awakenings which was treated with systemic steroids. In case of infection antibiotics were prescribed. The earliest date for the next study visit was 14 days after the last day of intake of exacerbation treatment. Primary study outcome was change in AHR to mannitol from 8 to 36 weeks measured as RDR. AHR was measured at all follow-up visits. Additional outcomes included accumulated ICS dose and number of asthma exacerbations. Outcomes were presented as mean±sd for approximately normally distributed variables and median (interquartile range; IQR) or geometric mean (95% CI) for variables with skewed distributions. Comparison of outcomes between groups were based on Chi-squared tests for categorical variables, t-tests for continuous variables with normal-like distributions, and Wilcoxon rank sum tests for continuous variables with skewed distributions. Change in continuous outcomes within groups was estimated, for the respective cases, by t-tests and Wilcoxon signed rank tests. Furthermore, spearman correlation coefficients were calculated. The same tests, with Wilcoxon signed rank tests in addition for continuous data with skewed distributions, were used within groups between visits. Change in outcome was further modelled by linear regression analyses, where change in the ACQ group was used as the reference. The crude and adjusted analyses were performed for the baseline level of the outcome. Model assumptions for linear regression were checked by the Shapiro–Wilk test and inspection of histograms and normal quantile plots of residuals. For some outcomes the assumptions were violated and the standard errors of the estimated effect were recalculated by robust linear regression to check if the violations were critical. The reported confidence intervals are based on the original linear regression analyses. Analyses of the main outcome RDR were performed as both crude and log-transformed to correct the skewed distribution. The results are presented on the original scale. Incidence rate-ratios of exacerbations were estimated using negative binomial regression. Analyses were performed using Stata Statistical Software (release 14; StataCorp LP, College Station, TX, USA). A total of 80 outpatients with asthma and current AHR to mannitol were included in this RCT study concerning asthma management based on either FeNO or ACQ (figure 1). The mean±sd age of the 80 asthmatics was 38±15 years, 48 (60%) of the participants were female, 46 (58%) suffered from atopy, 16 (20%) were current smokers and 22 (28%) were former smokers. Throughout the course of the study, the total number of treatment requiring exacerbations was 20 in the FeNO group and 25 in the ACQ group (p=0.6). Of these, four exacerbations in the FeNO group were treated with systemic steroids and six exacerbations in the ACQ group were treated with systemic steroids. Baseline characteristics for the FeNO group and the ACQ group at 8 weeks are shown in table 4. There were no statistically significant differences between the two treatment groups for AHR to mannitol (median PD15: FeNO 195.7 (93.3–395.8) mg versus ACQ 269.7 (129.1–454.2) mg, p=0.4) or any demographic details at algorithm baseline at 8 weeks. No difference in median (IQR) ACQ between the two groups was found: (FeNO 1.2 (0.2–1.6) versus ACQ 0.8 (0.4–2.0), p=0.7) or FeNO (FeNO 21 (13–32) ppb versus ACQ 22 (13–31) ppb, p=1.0). No difference was found in FeNO between the two groups when current smokers were excluded from the analysis: FeNO 24 (17–31) ppb versus ACQ 22 (14–30) ppb, p=0.4. Furthermore, no significant difference was found in FEV1 % predicted and forced vital capacity (FVC) % pred, whereas the FEV1/FVC ratio was significantly lower in the FeNO group than the ACQ group (mean±sd 73.9±9.4% versus 78.8±8.1%, p=0.02) (table 4). Systemic inflammation, measured by the level of high-sensitivity C-reactive protein, was similar in the two groups as was the use of ICS at enrolment (median (IQR); 400 (400–400) µg·day−1 in both groups). At baseline, 33 participants in the FeNO group took 200 µg ICS twice daily and seven participants took 400 µg ICS twice daily. Six participants in the FeNO group took LABA as a second controller. In the ACQ group one participant took 100 µg ICS twice daily, 32 participants took 200 µg twice daily and seven participants took 400 µg ICS twice daily. Five participants took LABA as a second controller daily in the ACQ group. Up and down titration in ICS treatment at each visit are shown in figure 2. Number of participants at each level of inhaled corticosteroid (ICS) treatment at baseline in the exhaled nitric oxide fraction (FeNO) group and Asthma Control Questionnaire (ACQ) group, followed by the number of participants regulated according to the algorithms at visit 2 and 3, and finally the number of participants at each ICS treatment step in the two groups at final visit. The ACQ group did not significantly change in level of responsiveness to mannitol from V2 to V3, whereas the level of responsiveness in the FeNO group decreased in this time period (p=0.04) (figure 3). At visit 3, there was a statistically significant difference in responsiveness (RDR geometric mean (95% CI): FeNO 0.02 (0.01–0.04) versus ACQ 0.05 (0.03–0.07), p=0.015) (figure 3). The level of AHR was unchanged in the FeNO group between V3 at 24 weeks and the end of study at 36 weeks (V4), whereas the ACQ group became less responsive between V3 and V4, resulting in similar responsiveness at the end of study in the two groups (figure 3). The overall change in AHR in the algorithm period from week 8 to the end of study at week 36 was not significantly different between the two groups (mean difference RDR (95% CI): ACQ group as reference −0.02 (−0.05–0.02), p=0.3) (table 5). Geometric mean (95% CI) response dose ratio (RDR) at each visit for the two intervention groups. Analyses of difference between groups at each visit are based on Wilcoxon rank sum tests. p-values at visits 2, 3 and 4 were p=0.53, p=0.015 and p=0.62, respectively. FeNO: exhaled nitric oxide fraction; ACQ: Asthma Control Questionnaire. At V3 FeNO was significantly lower in the FeNO group compared to the ACQ group (median (IQR): FeNO 18 (12–21) ppb versus ACQ 31 (18–42) ppb, p=0.01) (figure 4), although no significant difference was found when current smokers were excluded from the analysis (FeNO 19 (16–25) ppb versus ACQ 29 (15–52) ppb, p=0.1). An association was found between the level of airway responsiveness RDR and the level of airway inflammation measured by FeNO (rs=0.29, p=0.049) in the ACQ group. The FeNO group showed a significant increase in lung function compared to the ACQ group between V2 and V3 (FEV1 % pred 4.0 (1.1–7.0), p<0.05), calculated as mean difference (95% CI) based on linear regression analysis, with the ACQ group as reference (data not shown). Median (95% CI) exhaled nitric oxide fraction (FeNO) at each visit for the two intervention groups. Analyses of difference between groups at each visit are based on Wilcoxon rank sum tests. p-values at visits 2, 3 and 4 were p=1.00, p=0.01 and p=0.03, respectively. ACQ: Asthma Control Questionnaire. At the end of the study no significant difference between groups was found in AHR, RDR, FEV1 % pred, FVC % pred, inflammatory features, sputum eosinophils, ACQ or AQLQ (table 6), whereas FeNO was significantly lower in the FeNO group compared to the ACQ group (median (IQR): FeNO 15 (12–18) ppb versus 21 (14–29) ppb, p=0.03) (figure 4 and table 6). 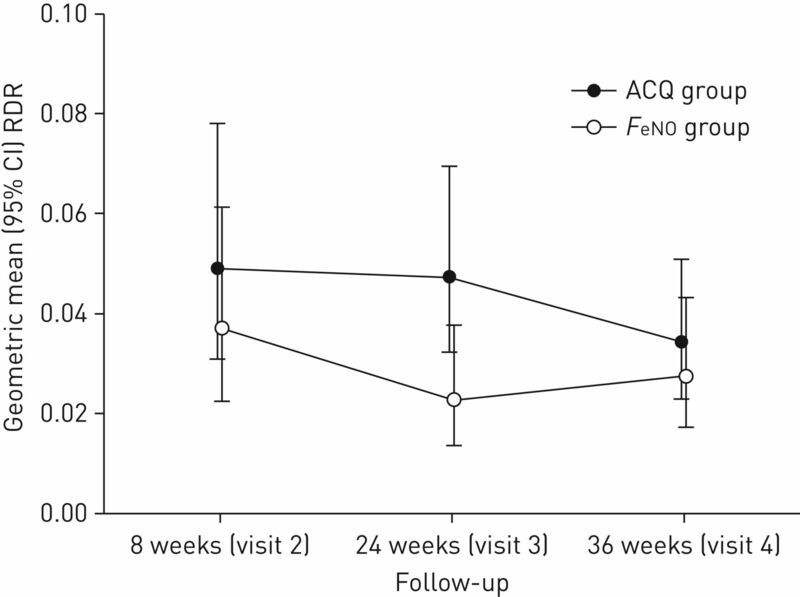 This difference in FeNO was not found when current smokers were excluded in the analysis (FeNO 18 (13–23) versus ACQ 20 (14–29), p=0.2). No significant difference in asthma symptoms expressed in mean ACQ or ICS use was found between the two groups at any visit (data not shown). This double-blinded RCT evaluated the use of FeNO versus ACQ as monitoring tools for asthma treatment of patients with possible Th2 asthma and a positive mannitol test and showed that asthma control indicated by a lower level of airway response to mannitol was the same after 36 weeks of treatment in the two groups; however, control was achieved faster when FeNO was used as a monitoring tool. 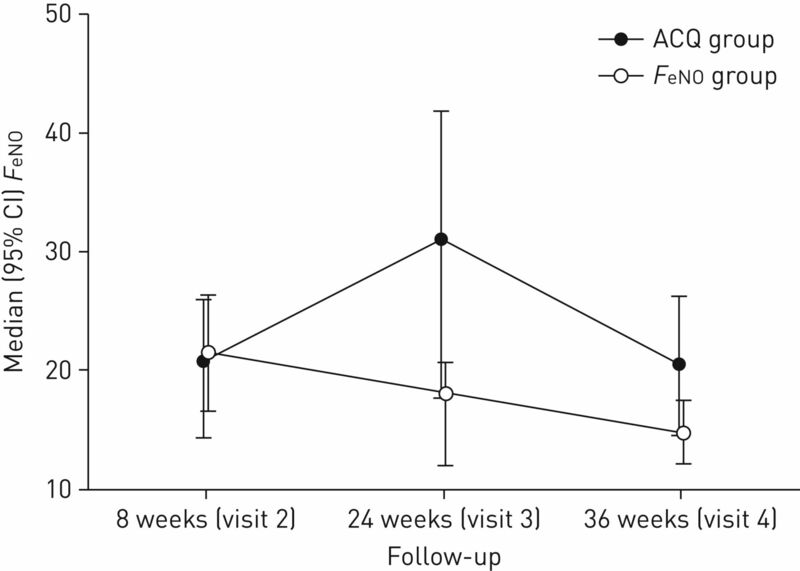 The fast improvement in asthma control in the FeNO group was supported by the results of increase in lung function and decrease in FeNO for this group of patients at week 24. Our study was powered to assess response to mannitol as a surrogate variable for asthma control. Previous studies investigating FeNO as a monitoring tool all used exacerbations as the primary outcome, including a less homogenous asthma group than in the present study [14, 20, 21]. Essat et al. showed a high level of heterogeneity in the definition of asthma exacerbations as outcome illustrated in a systematic review. When using RDR as a primary outcome, we used an objective measurement to assess the level of asthmatic status. We thereby avoided the risk of bias associated with patient self-reported exacerbations as reported by Smith et al. . In the present study only exacerbations requiring treatment of doubling of ICS and/or oral corticoid steroids and/or antibiotics were included, which resulted in a low number of registered exacerbations. A total of 10 exacerbations (four in the FeNO group and six in the ACQ group) required treatment with systemic steroid. This might have had an effect on the final result, but the following visit was postponed to assure wash-out. Powell et al. showed a significant reduction in exacerbations in pregnant women when using the FeNO algorithm compared to the ACQ algorithm. They prepared an optimised FeNO algorithm based on evidence from previous studies. We used the same algorithm in our RCT investigating real-life patients with a confirmed asthma diagnosis prior to enrolment. In the study by Powell et al. participants were seen monthly in 5–6 months resulting in a higher frequency of regulation in treatment than in our study where regulation was made at two visits. This might have had an effect on the final use of ICS as there is a difference in dose increments in the two algorithms. However, no significant difference in ICS treatment was seen between the two groups at any visit. Eosinophilic asthma (Th2 high) is associated with elevated levels of FeNO and AHR towards mannitol [6–8, 23], thus the group of patients in this study seemingly have eosinophilic asthma. This current homogenous group of asthma patients is different from former studies, with doctor's diagnosis of asthma only and a mix of airway inflammation. The support for Th2 asthma was that a high FeNO was found in a substantial number of both steroid-naïve and steroid-treated participants at baseline. Overall, we found that all participants in this group had improved asthma control from baseline to the end of study, assessed by AHR towards mannitol. To obtain statistical power we calculated that 39 participants were required in each group, thus we included 40 participants in each group. However, drop-out and exclusions in the course of the study resulted in 29 participants in each group at the end of the study. This is a limitation of the study and the final results might have been affected by this lack of statistical power. We did not register adherence in this study. This is a limitation of the study. The majority of participants entered the study with yearlong diagnoses of asthma and were used to treatment with ICS and other inhaled asthma medication, suggesting a continuous and similar, but possibly inadequate, adherence comparable to the background asthma patient population, which would not be a surprise as this is a real-life study. Furthermore, as a real-life study we did not have counters on the participants’ inhalers, but they were asked to take the medication as prescribed. At each visit, participants were asked about daily use of medication and the clinical staff repeated instructions for medication use at each visit to ensure best possible adherence, as well as device education. We included former current smokers in the study. Previous studies found that smoking has short- and long-term effects on FeNO . FeNO values in this study might have been affected by smoking, however, no significant difference in smoking status was seen between the two groups. Finally, steroid-naïve patients were included in the study and since they were referred for specialist care due to asthma symptoms and uncontrolled disease, a recommended low dose of ICS (200 µg twice daily) was prescribed. This could have affected the speed of asthma control when using the algorithm, as some of the asthma control had already been gained at week 8 (V2) in this group of patients. As a secondary outcome we investigated and found an association between increased AHR to mannitol and elevated FeNO level at week 24 (V3) in the ACQ group. This suggests a correlation between AHR and the level of FeNO. We observed an overall low number of exacerbations in this study, supporting the general use of a follow-up algorithm (FeNO or ACQ). No significant difference in symptom score or systemic inflammation was seen at any time during the study between the two groups. In addition, the level of lung function was found to be similar in the two groups. The use of ICS was reduced in the ACQ group more steeply than in the FeNO group, although a number of participants with elevated AHR were found at the end of the study in the ACQ group. This indicates that symptom control not always corresponds to the level of inflammation or objective measurements of asthmatic status. When regulating asthma treatment, objective measures should be taken into account even though this study did not show that the regulation could be made based on FeNO level only. This study did not include patients with high FeNO exclusively. However, all participants were receiving treatment with ICS at time of randomisation (except three participants in the ACQ group) which could give a lower baseline FeNO value than if all participants were steroid naïve. Included patients with low FeNO and AHR to mannitol might represent a different phenotype than the patients with high FeNO and AHR to mannitol. This possible inclusion of different phenotypes represents a limitation of the study. Future studies might be directed even more to this issue, ensuring inclusion of asthma patients with an eosinophilic phenotype only. However, the strengths of the study are that all included patients had asthma with symptoms, a doctor's diagnosis of asthma and a positive mannitol test. In conclusion, a more rapid improvement in asthma control was observed when using a FeNO guided treatment algorithm compared to an ACQ guided treatment algorithm, but level of asthma control was similar in the two groups after 9 months of treatment. This study is registered at www.ClinicalTrials.gov with identifier number NCT01978678. Individual de-identified participant data will not be shared. No additional documents will be available for this trial at any time. Conflict of interest: K.F. Bernholm, A.S. Homøe, H. Meteran, C.B. Jensen, C. Porsbjerg and V. Backer have nothing to disclose.
. Type 2 inflammation in asthma – present in most, absent in many. Nat Rev 2015; 15: 57–65. T-helper type 2 – driven inflammation defines major subphenotypes of asthma. Am J Respir Crit Care Med 2009; 180: 388–395. Exhaled nitric oxide in pulmonary diseases. Chest 2010; 138: 682–692. Exhaled nitric oxide a predictor of steroid response. Am J Respir Crit Care Med 2005; 172: 453–459.
. Inflammatory subtypes in asthma are related to airway hyperresponsiveness to mannitol and exhaled NO. J Asthma 2009; 46: 606–612. Exhaled nitric oxide thresholds associated with a sputum eosinophil count ≥3% in a cohort of unselected patients with asthma. Thorax 2010; 65: 1039–1044. Clinical characteristics of eosinophilic asthma exacerbations. Respirology 2017; 22: 295–300.
. Biomarkers of airway type-2 inflammation and integrating complex phenotypes to endotypes in asthma. Curr Allergy Asthma Rep 2016; 16: 71. A systematic review and meta-analysis: tailoring asthma treatment on eosinophilic markers (exhaled nitric oxide or sputum eosinophils). Thorax 2012; 67: 199–208.
. Biomarkers and asthma management: an update. Curr Opin Allergy Clin Immunol 2016; 16: 210–217.
. Relationship between airway responsiveness to mannitol and to methacholine and markers of airway inflammation, peak flow variability and quality of life in asthma patients. Clin Exp Allergy 2008; 38: 43–50.
. Airway hyperresponsiveness to mannitol and methacholine and exhaled nitric oxide: a random-sample population study. J Allergy Clin Immunol 2016; 126: 952–958. Management of asthma in pregnancy guided by measurement of fraction of exhaled nitric oxide: a double-blind, randomised controlled trial. Lancet 2011; 378: 983–990.
. Rapid method for measurement of bronchial responsiveness. Thorax 1983; 38: 760–765. The bronchial response to mannitol is attenuated by a previous methacholine test: but not vice versa. Clin Exp Allergy 2009; 39: 966–971. A new method for bronchial-provocation testing in asthmatic subjects using a dry powder of mannitol. Am J Respir Crit Care Med 1997; 156: 758–765. The use of induced sputum to investigate airway inflammation. Thorax 1997; 52: 498–501. The use of exhaled nitric oxide to guide asthma management: a randomized controlled trial. Am J Respir Crit Care Med 2007; 176: 231–237. Fractional exhaled nitric oxide for the management of asthma in adults: a systematic review. Eur Respir J 2016; 47: 751–768. Airway responsiveness to mannitol in asthma is associated with chymase-positive mast cells and eosinophilic airway inflammation. Clin Exp Allergy 2016; 46: 288–297. Short- and long-term effects of cigarette smoking independently influence exhaled nitric oxide concentration in asthma. J Allergy Clin Immunol 2005; 116: 88–93.